A well-appointed 2 bedroom mobile home in excellent condition, can sleep up to six persons and is situated on a large plot in a quiet part of this 5 star campsite. There is a fully-equipped kitchen with a gas hob, microwave oven and fridge freezer. There is sufficient cutlery, crockery, cooking utensils & glasses for at least six persons; also, socket outlets which accept UK 13 amp three-pin plugs. There is a double bedroom, a twin bedroom and another double bed that can be made up from the sofa in the lounge. A high chair is available. The lounge contains a corner seating unit, table & chairs for inside dining, electric cooling & heating equipment, a DVD player and a TV which receives UK Freesat TV programmes as well as radio. Off the lounge is a shower room with hand basin, which is also accessible direct from the double bedroom, and there is a separate WC. Hot water is provided by a gas boiler, which is serviced every year. The door from the lounge leads out onto a large decking area, which has sun and shade through the day, where there are separate patio & bistro tables & chairs, and sun loungers. To the rear of the decking there is a full-sized BBQ, storage chest containing games & other equipment, and a hammock strung between two trees. The large plot (emplacement), which overlooks the campsite garden, has ample space for pitching a tent if desired as well as for parking a car either there or behind the hedge at the rear of the plot. 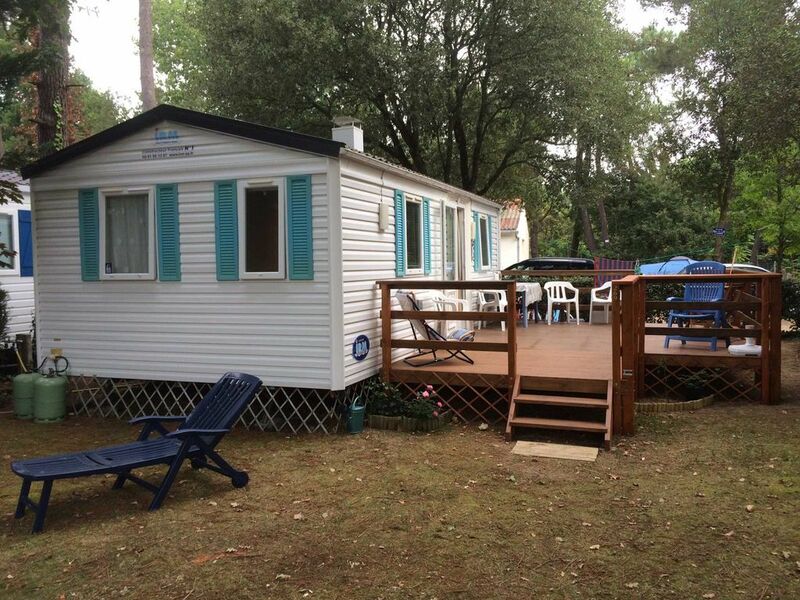 *Camping Les Biches is a popular, five star holiday parc (campsite) in the Vendee that offers emplacements (plots) scattered amidst pine woodland - it is ideal for young and old alike. There are excellent sports facilities – a multigym, two tennis courts, table-tennis and a multi-sports arena. There is also a fantastic pool complex including an indoor (heated to 29 degrees C) & outdoor pool, children’s pool and a Jacuzzi; during the peak season a lifeguard is on duty; There is also a Spa complex. The bar/restaurant with its lovely open-air terrace overlooks the pool complex: a favourite place for relaxing at the end of the day, or for taking refreshments while the youngsters whizz down the waterslides. Younger children will also enjoy making new friends at the large playground or at the children’s club (mornings during high season). There are activities for taking part in during the daytime and there is evening entertainment at the bar. Activities include aqua-aerobics, aerobics, scuba diving, bicycle hire, tennis, table tennis, mini-golf, badminton, football, basketball, boules/petanque, volleyball and fishing (at a nearby lake): Wi-Fi is available at a charge as well as limited free access around the reception and bar areas. Some facilities/activities are only available during high season. And when you feel like a change of scene, the nearest of the endless sandy Atlantic beaches is just three miles away. This area of France is noted for its sunshine record. It’s only a 10 minute drive to the lovely fishing port of St Gilles Croix de Vie with its shops and restaurants. The Grand Plage there is excellent for surfing and water sports. Washing Machines are located in a Laundry room near the Mobile Home There is an Iron in the Mobile Home, an Ironing Board is part of the Laundry Room facility. Ample room for parking on the Mobile Home site and by the hedge at the rear. Several paperback novels are available. There is a Games Room next to Reception. There are Tennis Courts at Camping Les Biches. There is a Spa complex near Reception. There are four pools at Camping Les Biches - including indoor, outdoor with slides and a paddling pool for children.